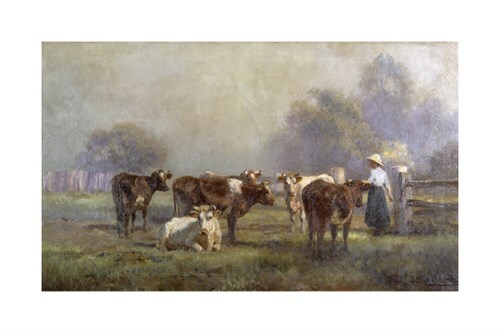 The original painting was oil on canvas and was called "Early Morning, Milking Time". Jan did not just develop 'a reputation for his animal painting', but a very good repuation, during his prime he was repeatedly written about as the top master of his genre in Australia. His painting showing a shearing shed interior with shearers busy using a sheering machine is the first in Australian history to show such machine on a painting. It hangs in the Bendigo Regional Art Gallery. Jan Hendrik Scheltema, the Dutch portrait and figure painter who then went on to paint landscapes and animals, was born on 7th August 1861 in The Hague. He attended the Royal Academy School in Antwerp. He arrived in Melbourne in 1888 and there developed a reputation for his finely executed paintings of cattle and horses. Jan also painted landscapes without animals in Australia and painted many with sheep. The portrait of his wife (as an Italian fruit vendor, post 1917) now in the gallery in Perth, WA, is a more well known piece by him.